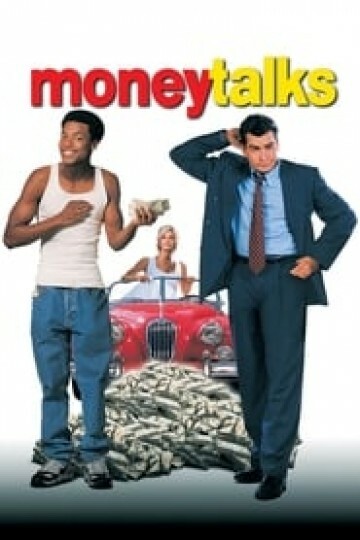 Money talk is a comedy starring Charlie Sheen and Chris Tucker that was released in 1997. This movie's revenue was more than double the cost of production, making it an smash hit at the box office. This movie follows the story of two completely different men. Charlie Sheen (James Russell) and Chris Tucker (Franklin Hatchett) whose fates cross paths when Franklin tries to hustle up more money. Franklin works at a car wash were he sells illegal tickets on the side. When the two men run into each other, Franklin is busted by James(who is an news anchor who is with the police). When Franklin is busted he blames James. Franklin heads off to jail where is paired with the main villain of the story line an European criminal named Villard who inadvertently tells him about some diamonds. Franklin flees the Villard's grasp and starts his hunt for the man who snitched on him (James Russell). The two men meet in a very hilarious manner and decide to team up for their own selfish needs. The men are introduced to each other's lifestyle, to much surpass and many humorous moments. When Franklin goes to visit James's fiancee at home he is mistaken for the son of a entertainer and treated as an equal in high society (even though his mannerisms are anything but sophisticated). When James goes to visit Franklin's place of residence he is made aware of the more simple life and how not everybody has it made. This causes the two men to develop a friendship of sorts that becomes more affirmed as the movie continues. Towards the climax of the movie the two men find the diamonds and seek to clear their name (they were accused of stealing the diamonds). In the end, Villard's greed becomes his own undoing when he is killed trying to recover the diamond. Franklin and James' records are cleared and they are awarded as heroes. Money Talks is currently available to watch and stream, download, buy on demand at TNT, Amazon, Vudu, Google Play, FandangoNow, iTunes, YouTube VOD online.